How To Remodel A Public Library From User-Oriented Perspective? 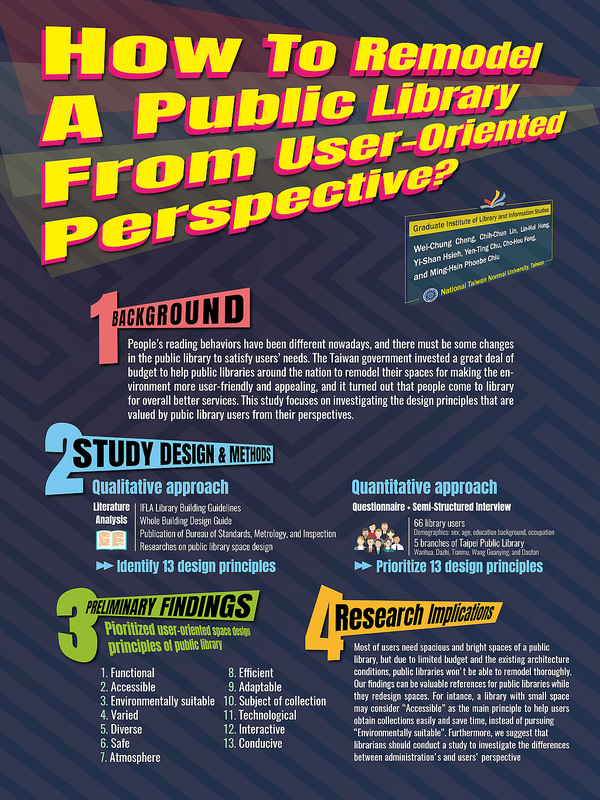 CHENG, Wei-Chung and LIN, Chih-Chun and HUNG, Lin-Hui and HSIEH, Yi-Shan and CHU, Yen-Ting and FONG, Cho-Hou and CHIU, Ming-Hsin Phoebe (2017) How To Remodel A Public Library From User-Oriented Perspective?. Paper presented at: IFLA WLIC 2017 – Wrocław, Poland – Libraries. Solidarity. Society. in Session 112 - Poster Sessions. People’s reading behaviors have been different nowadays, and there must be some changes in the public library to satisfy users’ needs, including administration physical, services, or spaces. The Taiwan government invested a great deal of budget to help public libraries around the nation to remodel their spaces for making the environment more user-friendly and appealing, and it turned out that people come to library because of overall better services (Ministry of Education, 2013). This study focused on investigating what kinds of design principles were more important from the user’s perspectives. We gathered different space design principles and organized them into 13 categories, which were “functional”, “adaptable”, “accessible”, “varied”, “diverse”, “interactive”, “conducive”, “environmentally suitable”, “safe”, “efficient”, “technological”, “atmosphere”, and “subject of collection”. We then asked 66 users, who were from different groups of genders, ages, occupations, and educational backgrounds, to rank these principles after they visited and used newly remodeled public libraries in different areas. 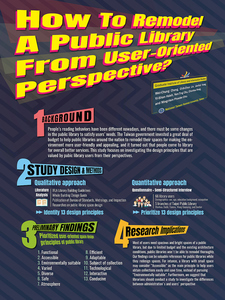 The results show that the most important principle is “functional”, which meant users expected that each public library space with its own function and it always would fulfill their needs; besides, they wished the space could improve interactions between users and collections.